Bus from Alor Setar to Kuala Lumpur is one of the most frequent bus service in Malaysia. Since flights are expensive and limited departure time, many locals and residents of Alor Setar especially working adults and students rely on this bus service to travel from Alor Setar to Kuala Lumpur. ETS Train service has attracted many commuters to travel by train instead of bus. However, due to limited daily trip, thousands of travellers are not able to get ETS train ticket and turn to bus service. As a result, bus service from Alor Setar to KL remains as the favourite choice among the commuters. There are many players in the market serving bus from Alor Setar to Kuala Lumpur. These players include Antar Holiday Express, Intercity Coach, Jasmine Express, Kesatuan Express, Plusliner, Eltabina Express, Sri Maju Express, Trans MVS Express, Konsortium and Transnasional. Buses deployed by these bus operators are spacious and secured to ensure every passenger having comfortable journey from Alor Setar to Kuala Lumpur. The duration for bus from Alor Setar to Kuala Lumpur takes on average 6.5 hours, depending on the traffic and weather condition on your travelling day. Washroom break will be given during the journey. The bus fare is in a range of RM 42.90 to RM 60.00, depending on your choice of bus operator. Please note that the buses from Alor Setar to Kuala Lumpur will depart at Alor Setar Bus Terminal. The bus from Alor Setar to Kuala Lumpur will terminate the service either at Hentian Duta Bus Terminal, KL Sentral, or TBS, is depending on your selection of drop-off point during your booking. 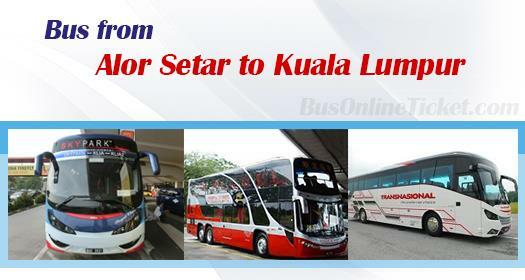 Even there are many departure schedules available for bus service from Alor Setar to Kuala Lumpur, passengers are advised to purchase bus ticket online with BusOnlineTicket.com to avoid disappointment. Instant booking confirmation upon payment is done. BusOnlineTicket.com also allow you to purchase your bus ticket in anytime, anywhere, and anyplace.